Valid question. I’m going to say this once, so listen up: “Legend of Korra” is one of the best shows on TV. If nothing else, it is definitely the best animated show out there. Sorry Matt Groening and Seth MacFarlane; you guys can’t hold a candle to Korra and Team Avatar. I loved “Avatar: The Last Airbender” when I watched it at a more age-appropriate time in my life. “Korra” started airing while I was in college, but it carried so much nostalgia with it that I had to give it a shot. Three seasons in, it has proven itself as more than a worthy companion piece to Aang, Katara and Sokka’s adventures. Toph was by far my favorite “Avatar” character. Not only was she sassy as hell and a badass bender (who, by the way, invented metalbending), but she did it all while BLIND. And apparently she grew up to be the Chief of Police in Republic City with two equally badass daughters. As usual, Toph is the best. This episode continued the Zaofu arc that saw Lin come head-to-head with her past in the form of her sister, Su. I was wondering all last week why Lin harbored so much resentment toward a sister who seemed absolutely delightful. In fact, this might have been the first time Korra and her team stopped in a city where they weren’t immediately antagonized. It was a refreshing change of pace. A visit to the acupuncturist revealed exactly why Lin held a grudge against her sister. It seemed that Su had a rebellious streak as a kid that put the two sisters at odds. Not only was Su the one that scarred Lin’s face, but she inadvertently shamed Toph into quitting the police force. 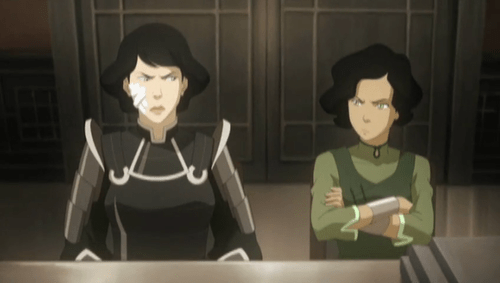 All of this rage came out in the form of an epic sister-on-sister showdown that was as visually stunning as a “Korra” fight scene should be. I particularly enjoyed them destroying Huan’s statue, with him deadpanning, “Actually…this looks kinda better now.” Leave it to sweet Opal to put an end to the violence. Besides being Bolin’s new love interest, I like having a genuinely nice character with no ulterior motives (or so we think) around for once. Sixteen hours of sleep later, and Lin was back to normal. She and her sister didn’t exactly make up, but they appeared to come to a temporary understanding. It was sweet, and Lin’s talk with Opal to follow her dreams and not try to constantly please her mother (a mistake Lin regrets) was touching. We also got a few scenes of Zaheer and his gang escaping Republic City. Nothing too groundbreaking, but apparently Zaheer can locate someone through meditation alone. That’s some advanced sh*t. Team Avatar better be ready for a duel. And oh yeah, in the middle of all that, Korra became the first avatar to learn metalbending! And Bolin tried really, really hard to learn it. I’m rooting for you buddy, you’ll get it eventually! This episode was pure fuiler. Nothing happened to advance the plot, but it was entertaining nonetheless. Hopefully it’s the last such episode we get this season, but the fact you can have episodes like this that barely feature Korra just proves how strong the character work on this show has been. “Original Airbenders” focused on Tenzin’s attempts to teach the new airbenders how to be air nomads. Easier said than done, considering these new recruits come from all walks of life and feature Boomi, the ultimate slacker. Tenzin decided the best way to get through to the airbending recruits was through lots of tough love, which prompted both Boomi and Jinora to rebel against him. Boomi just straight gave up, while Jinora ran away with Kai to go play with some baby air bisons. Kai may be a sneaky mofo, but he’s had Jinora’s affections since day one. Kudos kid. When Jinora and Kai get captured by a group of bison rustlers, Boomi has to rally the airbenders to go save them. It was a nice moment that reminded us all that though Boomi is prone to play the jester, he is also a born leader with a brilliant military mind. Jinora and Kai were rescued pretty easily, but then again a bunch of bandits with net guns never really stood a chance against a group of airbenders. Because this show loves to hit you over the head with “I learned something today” moments, Tenzin made up with Boomi and Jinora in typically adorable ways. He commended Boomi for his leadership, and even promised to think about letting Jinora get her master airbender tattoos. To be fair though Jinora, no father is going to be happy about watching his daughter get tattoos. Who do you think Tenzin is, Billy Ray Cyrus?